Enjoy safari among virgin African bushes is the Selous Game Reserve which is also the largest reserve in Africa! This park is easily accessible by road from Dar es Salaam but also by air from Zanzibar, Ruaha, Mikumi, Arusha, or Serengeti. With Selous Ngalawa Camp, your safari experience in Selous Game Reserve will be one of the most memorable experiences of your life for they opt to serve as the best tourism service provider on the southern Tanzania tourism circuit. The Selous Ngalawa Camp is a newly opened camp, bordering Africa's largest protected area, the untamed Selous Game Reserve. The Selous Ngalawa Camp, situated in its own forest reserve, is the original camp set up along the mighty Rufiji River near the Mtemere Gate, the eastern gate to the Selous Game Reserve. Depart with 4 x 4 vehicles from Dar es Salaam to Selous and arrive for three-hour boat trip at Ngalawa Camp. Morning pick up from your overnight accommodation in Dar Es Salaam. Thereafter, you will start the four days Selous Game Reserve safari to arrive in time for lunch at the Selous Ngalawa Camp. Later on, you will be embarking on an afternoon game viewing safari in the wilderness of Selous National Park. The evening game viewing tour features drives to the banks of the Rufiji. There’s an opportunity to see hordes of Nile crocodile and African fish eagles on lookout points near the river. Later in the evening, you will return to Selous Ngalawa Camp for dinner and overnight. Enjoy full day land cruiser with an open top driving around the park with lunch packets and mineral water. The full day starts with an extended safari of the Selous. You will wake up for an early breakfast, then collect your picnic lunches before starting the full day’s drive looking for the elusive wildlife. Elephants on the plains and in the bushes feed alongside zebra and impala. You will be scouring the different water holes for predator kills as well as catching the animals as they drink. Later on, return for dinner and overnight at Selous Ngalawa Tented Camp. Your walking Selous safari starts early this morning as you take a forest walking tour with the ranger guide. The resident wildlife guide will be pointing your animals of interest as well as prints of the African big and small game. See black and white colobus monkey, vervet monkeys, as well as weaver bird nests woven on acacia trees. You will return to have lunch at the camp before the next adventure in the afternoon. At 15:00, you will take an evening boat safari on the mighty Rufiji River. It is here that most of the thirsty animals congregate for a quick drink and it is the same time that the predators such as the crocodiles amongst hippos take their chances to feed on the other wildlife. Monitor lizard or the occasional tree squirrel and the Masai giraffe. Expect to see elephant browsing along the banks of the river, wild dog parks hunt for antelope in numbers, lions, as well as the bird life including lily trotter or pied kingfisher. Dinner and overnight will be at Selous Ngalawa Camp. Have breakfast before another morning game drive in the reserve. Your safari ends about 11:00 after an early lunch at the camp, then you will head back to Dar es Salaam. 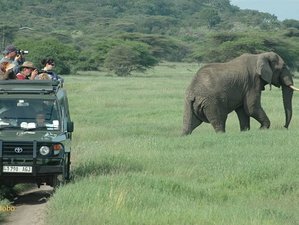 This safari will take place in Selous Game Reserve, Tanzania. In Selous Ngalawa Camp, you can expect good simple fare, although there’s not a huge variety. Breakfast is a buffet consisting of hot cinnamon rolls, eggs, and toast served with coffee or tea and juices. Lunch is a buffet or a simple packed lunch of sandwiches, fruit, and cakes if you’re going out on a full day drive. Dinners are a three-course affair, often taken out on the terrace under the stars, weather permitting. Starters are served at your table; think tempura vegetables or an onion soup with warm bread rolls. The main course is a buffet of various meats, pasta, curries, and vegetarian dishes. The dessert was once a sponge cake with chocolate sauce, a little bit bland, but it’s hard to get a lot of ingredients so far out in the bush. If you’re lucky, the bushmen may entertain you while you eat and during your walking safari with singing and dancing. Items of a personal nature e.g. laundry, tips, etc. Please book your flight to arrive at Julius Nyerere International Airport (DAR). Transfer from and to the airport is included. Selous Ngalawa Camp will pick you up from the airport.